Agile is the new “magic word” in management circles and is currently becoming a hype. An approach that was initially invented to the efficient development of software is currently conquering the management boards and organizational structures of smaller and larger companies. A new branch for consultants and trainers is growing: Agile coaches help companies to find their way to more agility in project management. But what is agile and can agility be prescribed like medicine? 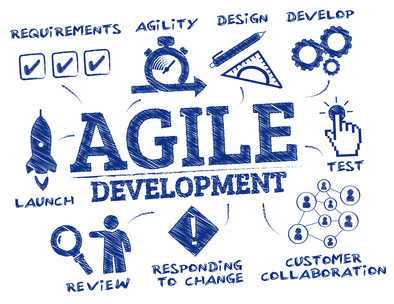 As I said, the term “agile” and agile methods come from software development, with the intention to make the developing process faster, easier and leaner. And since this worked quite well, the agile principles were recently transferred to general project management in companies. Agile is based on certain values and principles. Agile processes use change (even late during the process) to the customer’s competitive advantage. So far so good. To this extent, agile methods could in fact be a useful approach to complex problems, constantly influenced by external changes, in the business context. The problem is, however, that Agile is a completely new game. With game I mean a certain kind of interaction between the players (= all people involved in the game) applying certain rules and principles. It is one thing to know the rules and principles of the game and another thing to play according to these rules and principles. The latter normally needs a learning process, a change of habits, which is often not taken care of during the transition from conventional to agile methods. Often times there is the assumption, that it is enough to explain the rules of the game. However, it takes a completely new way of thinking and acting. If you look closer to some of the above mentioned principles you will become aware of the difficulties. Changes often are already a problem for individuals – not to mention for teams and organizations. “Humans are creatures of habit,” the proverb says. People usually find it difficult to step out of their comfort zone and welcome changes. The fear of uncertainty is great, and finally their job, their position, or their face could be at stake. There are so many badly executed or failed change processes in companies, which also stress the employees’ willingness to change. At least two specific soft skills are necessary to be able to welcome changes. The first is a new attitude, a different consciousness in regard to change. Through early conditioning, most people have hard-wired change with “dangerous” or “uncomfortable”. It would be necessary to reprogram this story. And this reprogramming does not work on an intellectual level, not through mere understanding. It takes new experiences to anchor this new consciousness and to be able to step out of the old automatic response to change. The second ability that is needed to welcome and use change is to consciously deal with the feeling of fear. Changes are always combined with fear and that is totally okay. Fear is necessary in order to enter new territory, in an attentive and careful way. However, since fear or feelings in general in our working world are still considered as unprofessional, and it is not okay to have feelings, most people have no access to their fear. Fear is not okay for them and must be avoided at any costs. But as long as fear is not okay, changes are not okay either. So on the one hand, a new attitude is needed in relation to feelings in general and in relation to fear. The attitude that fear is not negative, but a neutral and useful power to deal with changes. And the next step would be to learn to feel fear again and consciously use it to go into new territory. So if you are telling your staff during the implementation of agile methods that changes are to be used as a competitive advantage, then this is a well-meant advice, but in most cases this will not be so easy to implement, if the mentioned soft skills are still missing. Probably it is already clear to you that it is also not easy to just prescribe self-organization, especially if teams are used to follow the orders of supervisors or project managers. So in order to not let the project end in chaos, a lot of communication and clear arrangements are needed in self-organized teams. To achieve this it again takes certain soft skills. There is e.g. the need of someone who holds space for the project on the meta-level. Holding space is not equivalent to the classic “leadership” or project management. Holding space means that a person or a group of people use part of their attention to create an environment in which all people involved are able to work together in an empowered, nurtured, centered and inspired way. Problems are quickly identified and solutions are found. Internal quarrels and communicative misunderstandings are resolved, etc. Did you learn at school or at university to hold space? Most likely not. Just in order to maintain communication in self-organized teams and not to end up in misunderstandings, disputes, resentment or low drama, they need appropriate communication tools, which promote self-organization and self-responsibility in the team. It requires a conscious, open and responsible communication between the people involved and special tools for the case of conflict. Also the issue of self-responsibility is not trivial. There is a conditioning in regard to responsibility that is not useful and makes people avoid responsibility rather than take it. As long as responsibility (unconsciously) is considered as “a burden”, “hard”, “to blame for if something goes wrong”, etc., self-responsibility will only be okay until there is a problem. We live in a culture in which we are used to take only a certain degree of responsibility and to transfer the rest to a higher authority (Uncle Sam, the company I work for, the superior, …). Radical self-responsibility is a perspective or an ability, which has also to be learned consciously through new experience. Honest self-reflection is a challenge already for individuals and requires a lot of clarity and consciousness. Self-reflection in teams is even more difficult because the aspect of communication in the sense of mutual feedback is added. In order for this to work in a good way, a positive feedback and failure culture is the prerequisite. But quite honestly: where does such a culture exist, except in the beautifully written mission statements of companies? After 9 to 13 years of school career, to have a positive failure culture is a nice vision. The normal western European citizen has been conditioned for many years to not make mistakes. We learned that making mistakes can lead to exclusion and punishment in the worst case. Therefore, feedback is not necessarily considered desirable, but often seen as criticism or attack. Feedback from the supervisor is perhaps still accepted, but from colleagues? This attitude makes it difficult to implement this agile principle and carries the risk that open feedback and self-reflection lead to resentment and conflicts within the team. Here too, the ability to give and receive feedback must first be developed within a safe environment. A new culture does not develop simply by the decision to apply a certain principle from today on. These are just three examples of why the implementation of agile methods needs more than a mere workshop on agile methods. As long as the soil is not prepared and not all participants are able to apply the agile principles by learning the necessary soft skills, the seed of Agile will not be able to blossom. Like any new approach, Agile can only thrive in a new, fitting context. So, if you’ve discovered Agile as the next step for your company, you should also consider providing the appropriate soft skills to everyone involved.